We recently spent a brilliant 5 minutes with top ranking British tennis player, Heather Watson. Heather has been storming the international tennis stage after winning the US Open Girls’ title as a 17-year-old junior in 2009. In 2012 she became the first British woman to reach the third round of Wimbledon for 10 years and and most recently performed strongly at the Indian Wells WTA tournament showing very encouraging signs for the season ahead. We take a 5 minute glimpse into the life and times of this remarkable young woman. What is it about tennis that inspires you? Why is it a great sport for women? Tennis keeps you fit and healthy while being fun and social at the same time. It is a sport you can play your entire life so I would recommend it to anyone. What advice would you give to 16-year-old you? I would tell myself to not give up even through the hardest times because they will make you stronger. I have learned so much about myself as a person and about the world around me by pushing through any obstacle or struggle that has come my way. They have actually helped get me to where I am today and I know there will be more tough moments ahead of me. What’s the best way to start playing? Coaching lessons, group sessions, a weekend hit-about in a park with a friend? I started playing in group sessions with friends in Guernsey and that made it very enjoyable and fun. I think it is a great way to start tennis. Does tennis improve your ability in other sports, i.e. running/HIIT etc? It helps your hand eye coordination, footwork and endurance for all sports. Tennis wear for women has definitely become more fashion-conscious over the last few years. Are you glad this is the case? Yes. Definitely. I am a big fan of fashion and love seeing all the different outfits at every tournament. At SportStylist, we love the tennis skirt so much we’ve been known to wear them in the gym as well as on the courts. What are your favourite pieces and footwear to train in and to wear for a match? My favourite tennis shoes are the New Balance WC996PG2, they allow me to be really responsive, plus I love the coral pink colour! 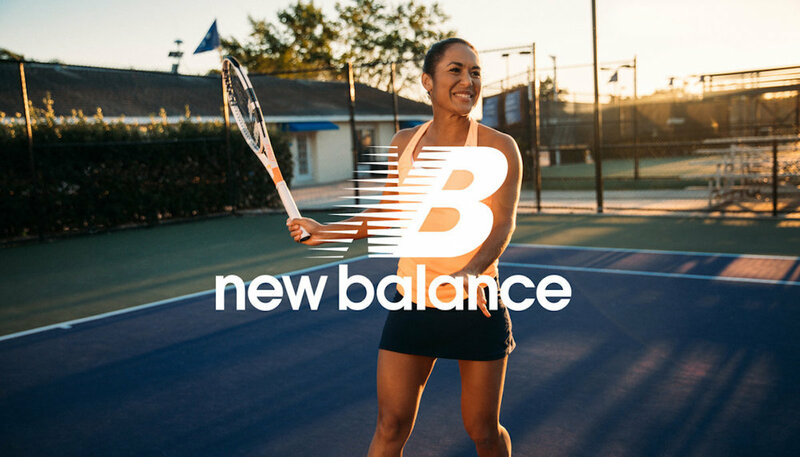 The New Balance Tournament Racerback Top looks great with these shoes, it’s really comfortable and hugs the body well in the right places. You’re 22, most women your age are at university, going on holiday with their friends, out clubbing – do you feel as though you’ve missed out? Or is the sacrifice worth it? It is definitely worth it. I get to travel the world and experience new cultures and play a sport I love in front of great fans who want you to do well. I feel very lucky to be doing what I do.